It was held after an interval of one and a half years. Last edited by ErnieYoung on 16.01.2018, 14:11, edited 7 times in total. That wig is back on Hamada! Heh, reminds me of when Hosei had to do that skydiving whilst having his head shaved mid-air batsu back in the 90s. He started wearing certain hats that would cover it all up on other shows because he was embarrassed But on Nakai-kun Onsen they jokily made a point of forcing him to take his hat off or they'd all get up and leave, which they did so he was sat alone going "OK OK, I'll do it!! Come back!". I remember that batsu but what I don't understand is why Cocorico had to join him. Was it something to do with Hosei taking them down with him? Or were Downtown just feeling a little extra sadistic that day? 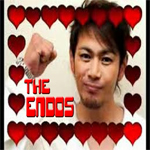 I think Endo had to do it because he did poorly on a Shichi Henge (they show a clip of it). Tanaka by comparison did great on his Shichi Henge (I think they also show a clip of that in the episode). But he comes along anyway to support Endo & Hosei. I don't know exactly why he ends up having to do it too, I just assume that whilst supporting the others, Downtown gradually coax him into taking part as the ultimate gesture of support.